Thirty-one persons were killed and 48 others injured in a massive bomb attack on Damboa, Borno State. The police in the state said on Sunday that 21 people were killed. But residents said 31 people were killed in the attacks suspected to have been carried out by members of Boko Haram. According to the police, the explosion occurred on Saturday night in the town, about a distance of 90 kilometres from Maiduguri, the capital of troubled Borno State. The police in a statement by the Borno State Command Public Relations Officer, Okon Edet, said, “On 16/06/18 at about 2045hrs, an explosion occurred at Abachari area, on the outskirts of Damboa Local Government Area of Borno State. “At the sound of the explosion, personnel of the Nigeria Police and members of the civilian JTF mobilised to the scene discovered 20 dead bodies and 48 injured persons in a suspected terrorist attack. 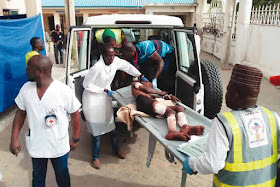 Edet noted that an investigation was ongoing to unravel the nature of the attack, adding that the Commissioner of Police in Borno State, CP Damian Chukwu, had urged members of the public to continue to be vigilant and watchful. “He also urges them to always provide useful information to the security agencies for necessary actions,” he said. Meanwhile, a source in Damboa, who spoke on condition of anonymity, told Punch that a rocket-propelled grenades allegedly fired by the members of the Boko Haram sect left no less than 31 persons dead. He claimed that the insurgents unleashed suicide bombers and later hit the area with rocket-propelled grenades. He said the suicide attacks were first unleashed on the community to draw people out while the rocket-propelled grenades were shot at the gathering of sympathisers. This, he said, was the reason for the high casualty figure. He said, “Following the suicide bombings, the jihadists fired rocket-propelled grenades into the crowds that had gathered at the scene of the attacks, thus increasing the number of casualties. He explained that the initial attacks were by two suicide bombers who detonated their explosives in Shuwari and nearby Abachari neighbourhoods in the town around 10.45pm on Saturday, killing six residents. He said, “The latest death toll is now 31 but it may increase because many among the injured may not survive.